Scanning’s incorporation of both photography and painting reflects the artist’s long-standing commitment to both media. This dual interest, which persisted throughout his life, can be traced back to his days as a student at Black Mountain College near Asheville, North Carolina, in the late 1940s. Indeed, much of his work subsequent to the Combines consisted of an integration of the two media. Within Rauschenberg’s oeuvre, photographic images first assumed a central role in the transfer drawings. This process, which he “discovered” in 1952 but did not exploit extensively until 1957–58, involved moistening a magazine or newspaper illustration with a solvent (turpentine or lighter fluid), placing it facedown on a sheet of drawing paper, and then rubbing the back to impress the image on the paper surface. Although he made a few attempts to apply the transfer technique to canvas, he apparently found the small scale and pastel tones of the images incompatible with the demands of painting and did not pursue it. When Rauschenberg began the silkscreen painting series in 1962 he worked exclusively in black and white; in June 1963, he turned to color. Scanning is a transitional work because all of its images are screened in black except one: the postcard-like beach scene turned on its side at the painting’s left edge. Identified by Rauschenberg as a view of East Hampton in Long Island, New York,4 it is screened in red (which, overlapped by yellow, is orange in tone), yellow, and blue. A hand-painted area in yellow ochre at the upper right of the canvas helps balance the composition, as do several gestural strokes in blue (one with drips running down the surface) near the painting’s central axis and at the right side. Scanning contains a series of similar dialogues between the painted and the screened. Prior to screening the images in Scanning, Rauschenberg variegated the painting’s surface and subdivided the composition by applying a layer of white paint, probably by means of a roller, along most of the left side. This undercoat gave the left half of the canvas a brighter base and the images a smoother surface upon which to rest, and it helped accentuate the contrast of texture and pattern found among the images and weaves of the various screens. The grid pattern of the birdcage near the painting’s top center, for example, plays against the tight polka-dot pattern in the photographer’s strobe light umbrella below as well as against the diagonal, herringbone-like texture seen in the sky in the image of the rooftop water towers (derived from a photograph taken by Rauschenberg) to the left. In this work, the artist knits forms and images together in a loosely structured choreography. For example, the flatly painted circle that sits on the painting’s surface within the penciled outline of what was perhaps a paint can (near the top center of the canvas) plays against both the brushy white patch to its left and the segmented circle of the dish antenna of the spacecraft in the silkscreened image to its right (fig. 3). In turn, segmented circles similar to those of the antenna are also found in the beach umbrellas and, by implication, since it is pictured in a side view, the strobe light umbrella. A series of strong diagonal brushstrokes in white and black in the lower right corner engages with the screened image of the wing of the spacecraft tilting in the opposite direction, about two feet to the left. 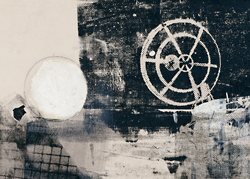 Since the 1960s, many writers and scholars, following in the wake of John Cage and Brian O’Doherty, have viewed such accumulations of mass-media and other images in Rauschenberg’s work as an embrace of a sought-after randomness, seeing the paintings as offering a generalized portrait of American life during the time they were created.5 Others, like Rosalind Krauss, have asserted that the works present allegories composed of collective memories and clichés of association that are their own reason for being.6 Still others, including this writer, conceive of the silkscreen paintings as offering metaphors for contemporary consciousness7 and believe that while meaning in Rauschenberg’s work is impossible to pin down precisely, close examination of individual artworks allows certain themes and patterns to emerge. For example, both the title of Scanning and its rapid-fire layering of images in black and white would seem to respond to the massive influence of broadcast technology in the early 1960s.8 They perhaps allude to the new, fragmented ways that visual information was consumed at the dawn of the information age—a process analogous to the way the eye must travel over Scanning’s surface to identify and make sense of its disparate details. The painting’s widely ranging images vary in scale and depth; some are deep and recessive, while others are more graphic and flat. Also, some photographs are reproduced in whole, while others are fragmentary. The sense of motion involved in processing these images is paralleled by Rauschenberg’s allusions to transportation and movement in Scanning’s iconography, which includes mosquitoes in flight; birds, probably doves, in a cage (with the face of a man peering through); an army truck (the fragment is cut in such a way that, years later, the artist and others mistakenly identified it as an image of the army helicopter that appears in some of the color silkscreen paintings);9 an old photograph (ca. 1910) of the Staten Island Ferry Terminal in Lower Manhattan;10 a rocket blasting off, albeit lying on its side (Mercury 8 with astronaut Walter Schirra Jr. aboard [fig. 4]);11 and the Mariner 2, an American space probe to Venus, whose antennae also served as a kind of scanner, perhaps another reference to the painting’s title.12 The image of dancers is a reproduction of a photograph of members of the Merce Cunningham Dance Company in rehearsal or performance, and it recurs, as do all of the others, in multiple silkscreen paintings. In Scanning, the dancers are overlapped with a picture of a newly constructed highway cloverleaf interchange (appropriated from LIFE magazine),13 which connotes the path of the dancers’ circuitous movements. Also contributing to the theme of movement are the paw prints that extend down the left side. These were made by Sweetie, the artist’s pet kinkajou (a nocturnal rain-forest mammal with a prehensile tail). This trail was a happy accident—a result of the painting having been produced on the floor of the studio—and the artist chose to preserve it in the work. Rauschenberg said about this much later, “I respected it. I thought . . . I can use that.”14 Calvin Tomkins, recounting his visit to the artist’s studio in 1963, when Rauschenberg was beginning Scanning, offers insight into why Rauschenberg felt he could “use” this improvised addition and connects it to his admiration for the Cunningham dancers: “Bob told me that he admired and even envied the situation of the dancers in Merce’s company, for whom there was never a final, definitive way of doing things. ‘I feel very close to that situation in my own work,’ he said. ‘I want to put off the final fixing of a work as long as possible. Of course, you can’t do that in a painting. Once it’s done, it’s fixed, and you can only maintain the illusion by a sort of ambiguity in the composition.’”15 In an interview at the San Francisco Museum of Modern Art in 1999, Rauschenberg said of Scanning, “This was about the time that the Cunningham Company was breaking up. This is why I held onto this one so much.”16 Scanning was one of the few silkscreen paintings he did not sell but retained for his personal collection. In 1963, when Scanning was executed, Rauschenberg was devoting as much time to the dance company as to his painting, and he had begun to choreograph dances and performance pieces of his own. He had been closely associated with the company since 1954, and in 1961 he was designated the official lighting designer and stage manager, a role that involved accompanying the Cunningham dancers on tour. His first choreographed work, Pelican (fig. 5), premiered in May 1963 at an evening of performances by Judson Dance Theater for the Pop Festival in Washington, D.C. 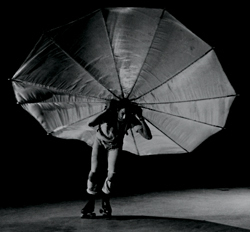 It featured costumes (gray sweatsuits) and music (a collage of found taped sounds)—also by Rauschenberg—and it involved his and another male performer’s moving around the space on roller skates, wearing structures of stretched parachute silk on their backs, as Cunningham dancer Carolyn Brown performed en pointe between them.17 Umbrella and parachute forms frequently recur throughout Rauschenberg’s oeuvre; however, in Scanning, Brown’s image appears especially close to the umbrella form, suggesting an allusion to the motifs of Pelican. Thomas Crow, “Saturday Disasters: Trace and Reference in Early Warhol,” in Modern Art in the Common Culture (New Haven, CT: Yale University Press, 1996), 250. Crow suggests that Warhol also manipulated his silkscreened images. These early lithographs also incorporated imprints of found objects: a saw in Suburban, and a sheet of notebook paper in Urban. 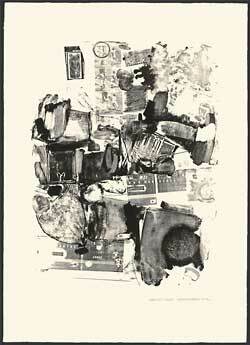 Robert Rauschenberg, in text appearing on center panel of Autobiography (1968). In a very short time, the silkscreen paintings had a reciprocal influence on the prints. 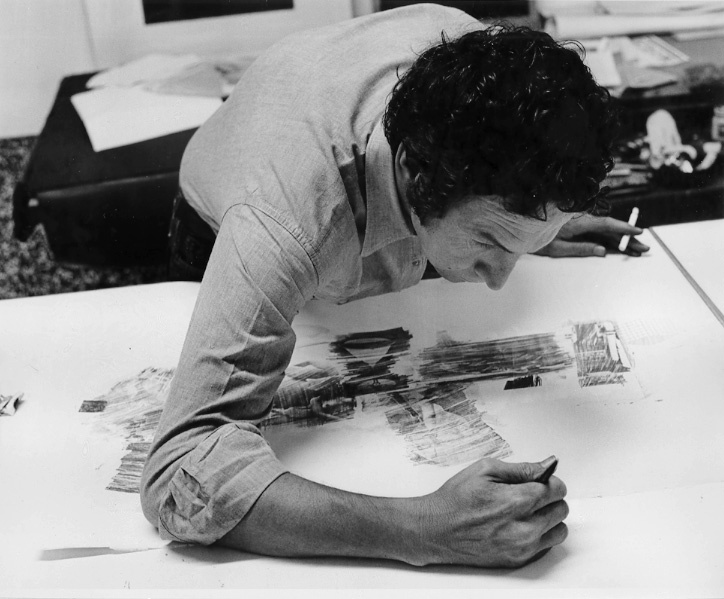 By 1964, not only did Rauschenberg begin to use the same imagery in his prints as in his paintings—for example, the lithograph Breakthrough I (1964)—but he started to transfer images to lithographic stones by means of a silkscreen process. Robert Rauschenberg, video interview by David A. Ross, Walter Hopps, Gary Garrels, and Peter Samis, San Francisco Museum of Modern Art, May 6, 1999, 66. Unpublished transcript at the SFMOMA Research Library and Archives, N 6537 .R27 A35 1999a. One of the most ubiquitous statements in the Rauschenberg literature is the following, made by John Cage: “There is no more subject in a combine than there is in a page from a newspaper. Each thing that is there is a subject. It is a situation involving multiplicity.” John Cage, “Robert Rauschenberg, Artist, and his Work,” in Silence: Lectures and Writings by John Cage (Middletown, CT: Wesleyan University Press, 1961), 101. Originally published as “On Robert Rauschenberg, Artist, and His Work,” Metro 2 (May 1961): 36–51. Brian O’Doherty reinforces this view by asserting that the proper way to look at his art was with the “vernacular glance,” which is the “city dweller’s rapid [and disinterested] scan” that refuses to recognize any connections or content among the objects and images. Brian O’Doherty, “Rauschenberg and the Vernacular Glance,” Art in America 61, no. 5 (September–October 1973): 82–87. These ideas are echoed by Irving H. Sandler in The New York School: The Painters and Sculptors of the Fifties (New York: Harper & Row, 1978), 173–83; and Jonathan Fineberg, in Art Since 1940: Strategies of Being (Boston: Prentice Hall, 2011), 167–78. Rosalind Krauss, “Rauschenberg and the Materialized Image” and “Perpetual Inventory” in Robert Rauschenberg, ed. Branden W. Joseph (Cambridge, MA: MIT Press, 2002), 39–55, 90–131. Originally published as “Rauschenberg and the Materialized Image,” Artforum 13, no. 4 (March 1974): 36–43 and “Perpetual Inventory,” October 88 (Spring 1999): 86–116. The idea that Rauschenberg’s works can be seen as models of human consciousness derives from an essay by Leo Steinberg, in which he introduced the notion of Rauschenberg and the “flatbed picture plane.” Leo Steinberg, “Reflections on the State of Art Criticism,” in Joseph, Robert Rauschenberg, 27–37. Originally published as “Other Criteria,” in Leo Steinberg, Other Criteria: Confrontations with Twentieth-Century Art (New York: Oxford University Press, 1972), 55–91. For a discussion of Rauschenberg’s silkscreen paintings as related to television, see Branden W. Joseph, “‘A Duplication Containing Duplications’: Robert Rauschenberg’s Split Screens,” in Joseph, Robert Rauschenberg, 133. Rauschenberg, interview with Ross, Hopps, et al., May 6, 1999, 66. I am indebted to John Tauranac, a specialist on New York architectural history who teaches at New York University’s School of Continuing and Professional Studies, for this identification. Rauschenberg’s source for this image was Wally Schirra, “Bull’s Eye from a Front Row Seat: First Color Photographs and Wally Schirra’s Narrative,” LIFE, October 26, 1962, 34. The photograph shows various approaches from New Jersey to the George Washington Bridge, whose six-lane lower deck had just been completed. LIFE, November 9, 1962, 86. Rauschenberg, interview with Ross, Hopps, et al., May 6, 1999, 63. Calvin Tomkins, “The Sistine on Broadway,” in Robert Rauschenberg: The Silkscreen Paintings, 1962–64, ed. Roni Feinstein (New York: Whitney Museum of American Art, 1990), 13–17. Originally published in Calvin Tomkins, Off the Wall: Robert Rauschenberg and the Art World of Our Time (Garden City, NY: Doubleday, 1980), 192–200. Rauschenberg, interview with Ross, Hopps et al., May 6, 1999, 62. Rauschenberg choreographed and designed eleven performances between 1963 and 1968. For archival footage of a performance of Pelican from 1963, see Robert Rauschenberg in Pelican, in Making Sense of Modern Art, SFMOMA, December 1998. Accessed April 24, 2013, https://www.sfmoma.org/explore/multimedia/videos/37. I am indebted to Carolyn Brown for identifying the five dancers. Carolyn Brown, Chance and Circumstance: Twenty Years with Cage and Cunningham (New York: Knopf, 2007), 326. See, for example, Masaaki Sekiya’s photograph (1964) of the Merce Cunningham Dance Company’s rehearsal of Aeon in Robert Rauschenberg: A Retrospective, ed. Walter Hopps and Susan Davidson (New York: Solomon R. Guggenheim Museum, 1997), 254, fig. 220. This is suggested by Calvin Tomkins’s reports of his numerous visits to the studio to interview Rauschenberg for his essay “The Sistine on Broadway,” first published in 1980 in Tomkins, Off the Wall, 192–200. Cite as: Roni Feinstein, “Scanning“, Rauschenberg Research Project, July 2013. Cite as: Roni Feinstein, “Scanning,” Rauschenberg Research Project, July 2013.